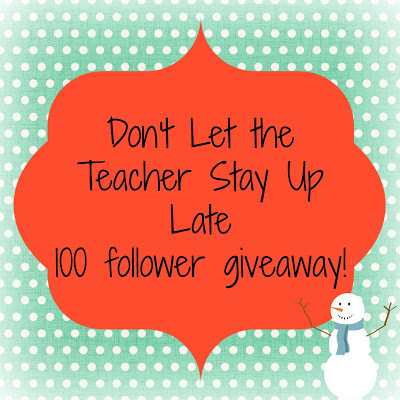 I heart giveaways and followers! I have to say, one of the most exciting things about this whole blogging experience has been gaining followers! It is so hard to do... and I get seriously giddy when I log in and see I have a new follower!!!! :) So today, when I saw Melissa over at Don't Let the Teacher Stay Up Late was now following me, I was so excited! I love reading comments and was pumped about the comment from her:) Low and behold, I head on over to her blog, and find she is having a 100 follower giveaway!! I have to say, I'm slightly jealous! I cannot wait until I have enough followers for a giveaway! I'm thinking maybe at 50? :) Anywho, her giveaway is absolutely WONDERFUL! 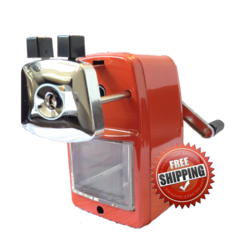 It includes one of those awesome quiet pencil sharpeners that I would just DIE to have in my room. There are SO many great activities from many wonderful blogs on there as well! I will keep my fingers crossed and hope I win:) You should head on over and check it out for yourself!